Since 2011, Hala Gear has been releasing top-quality SUP boards. Stable enough for all novice paddlers and fast enough for experienced paddlers, Hala inflatable SUPs are perfect for a bit of everything. To make it better, the boards are big enough to even accommodate your dog during the ride as well as burly enough for waves and burly water. Currently, Hala boards come in different sizes ranging from 7’6”-14’ and they’re pretty versatile as well. 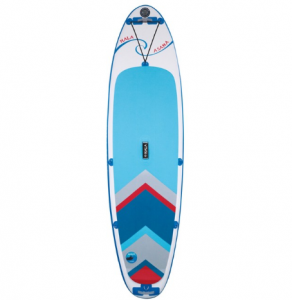 They also offer one of the best SUP board warranty packages currently available in the market. Created with Yogis in mind, the Hala Classic Assana 10’6” board is a good fit for both experienced and evolving paddlers who would like to excel. The 34-inch width base is exceptionally good for SUP Yoga while at the same time surfing on the lake. That being said, the first impression you’ll get with this board is the extremely attractive graphics and the color. These features coupled with the rugged construction makes the board look quite lively. Still on the design, this board combines the fiberglass stringer with the PVC construction which gives it a very unique shape design among boards in this category. Also, due to this feature the board is very strong and durable, as it can withstand heavy use. The glide rocker has a mellow nose rocker through the midsection, and a tail rocker. These features will help you optimize the speed and maneuverability of the board. This classic iSUP also comes with 3-deck rigging points perfectly placed at the board’s nose to enable you safely keep a paddle and a water bottle during your workout. To cut a long story short, the Hala Asana is suitable for avid explorers and Yogis with wanderlust alike. • Weight capacity: 275 lbs. • The glide rocker features a minimal tail for optimization, flat middle for traction, and a mellow nose rocker. • 3-year warranty which ensures you of durability and compatibility. When it comes to performance issues, Hala Asana is unbeatable, especially for Yoga fans and water fitness gurus. This board enables you to flow on any Whitewater River in a stable and dynamic way, which is a big plus for most fitness enthusiasts. Also, the 34-inch base means it’s very stable which is a very good thing for inexperienced paddlers or when you’re paddling with furry co-pilots. All in all, it’s a lot of fun to paddle with this large board. For a board of its size, increased stability is expected. However, this board is very stable compared to other brands of its size. It’s fairly wide side-cut coupled with the squared-off tail is what gives this board the literal stability. In short, it’s the best fit for beginners to learn their way through rough waters. Furthermore, this board doesn’t lose its maneuverability because of the increased stability. If you transfer weight to the board’s back, you can easily turn. If you paddle using this board, you’ll be surprised by the remarkable distance per stroke it covers. This Hala Board has the ability to maintain the right course while gliding with minimal corrective paddling. Due to its exceptional stability as well as the slightly raised rear stomp pad, this board can easily navigate past any obstacle as well as make very tight turns. You should keep in mind that this Hala Classic Asana board is an all-round iSUP meant for any kind of surfing – be it on river or ocean. In fact, it’s arguably the best board out there for performing forward and backward strokes. Coming with both a small 12-Volt car pump and a hand pump, you won’t have any problems inflating this board. You can choose to use the hand pump alone to inflate it or alternatively use the car pump to fill it up to around 1 or 2 psi. After this, you can reach the recommended 15 psi using the hand pump. The chest traps and the paddled waist on the backpack can come in handy especially in rugged terrain. The backpack is also fitted with wheels which are important when moving it on hard surfaces such as parking lot. Finally, all the 3 fins detach and fit nicely into the backpack’s pocket. The 3-year warranty that comes with this board should definitely be a confidence booster. You’ll also be added a repair kit just as most manufacturers do. Retailing just below $1000, this is by no means a cheap paddle board. In fact, it’s among the costliest SUP on the market. However, this board is certainly worth every penny you get to pay. To sum it up, Hala Classic iSUP is an outstanding board that can certainly satisfy both novice and advanced paddlers. If you’re a first-time user or a SUP-yogi this board is tailor-made for you. Additionally, its exceptional quality, performance and versatility rank it among the best overall inflatable SUPs. The only downside is the price which is compensated by the high quality.